Roco just delivered the exquisite new German Deutsche Bundesbahn "Schwabenfeil" Express set. The"Schwabenfeil" ran between Dortmund and Stuttgart. Set includes one class BR 03.10 express locomotive with SOUND & Illuminated running board lights. 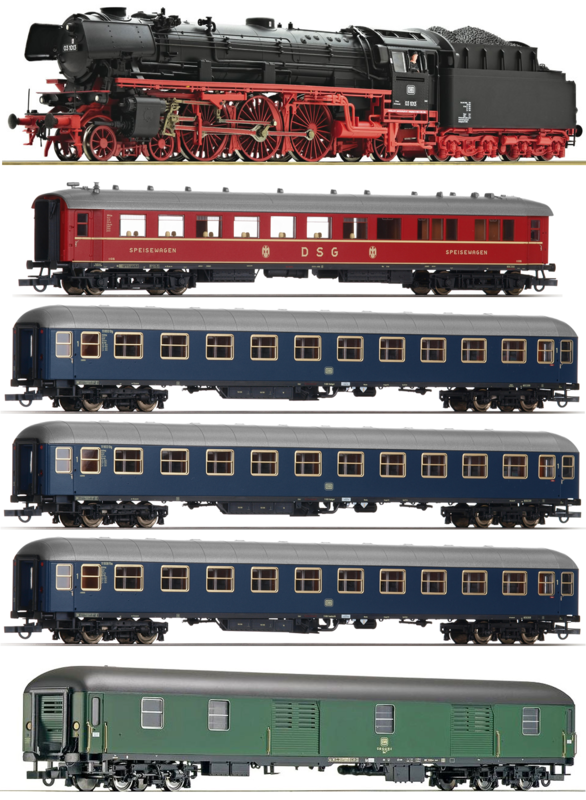 It also includes three blue 1st class coaches one restaurant car and one baggage car. Prototype: The German Railways Class 03 was a Pacific-type 4-6-2 steam locomotive built for passenger service starting in 1930. It's design was based on the German 01 Pacific; also an Einheit (standard design) passenger locomotive. Two hundred and ninety-eight 03s were constructed through 1938 and they served throughout the German rail network. After the war, the DB had one hundred fourty-five 03s in it's fleet, the DR had eighty-six 03s and the PKP received thirty-five 03s. The Class 03 developed 1943 HP and reached a maximum speed of 81 MPH (130 KPH). The last ones were in service with the DB until 1972. Steam locomotive 03 1013 of the Deutsche Bundesbahn. Epoch III. 5 pole can motor with flywheel. Exquisite 4 piece Schwabenpfeil express train of the Deutsche Bundesbahn. Set consists of three blue 1st class coaches and one DSG restaraunt car. Highly detailed coaches with full interiors. Coaches can be retrofitted withl interior lighting kits #40360. Coupler pocket according to NEM 362 standards with close coupling mechanism.